Ski bindings next to a motor oil pan and electrical terminals next to a glasses bath. The product wall in series production at the Werdenfelser workshops is varied, colourful and rather impressive. As is the operation itself. A place that brings 168 people with disabilities and 42 carers together under one roof. Where people with various disabilities work together according to the motto "encourage and support". Where great products are created and humanity reigns. Despite the considerable size, clear guidelines and economic objectives are quietly heard and appreciated: "This is a family operation, not just in regard to the work." This is how Jeörg Hibler, department head at Werdenfelser Werkstätten, describes his professional home. Run by KJE-Hilfe e.V., the facility also places great value on the holistic personal development of each individual. And what seems unusual to outsiders is no big deal for him: "We all interact normally with each other and appreciate the diversity that we have here - in terms of people, work rooms, disciplines, materials and products." 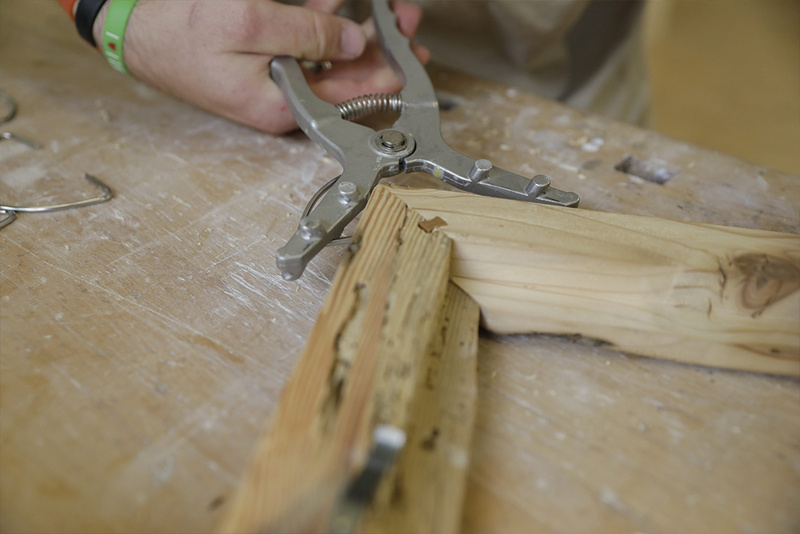 The sound of the machines, the lively hustle and bustle and the smell of wood in the carpentry workshop. A woolly warm, quiet atmosphere and music in the weaving workshop. A fervent drive between the mountains of laundry and the ironing tables in the laundry. Milling, punching and labelling at the work stations in series production. And everywhere: A loud laugh here, a dreamy painting break there. A hearty pat on the back now and then or a chat in the corridor about the latest football results. Everyone works and creates - with a little more time and within the context of his or her personal abilities. This is ensured by in-house equipment construction. With great ingenuity, they tinker and screw things together so that every employee can work according to his or her disability. There's no such thing as impossible. This also applies to interpersonal relations in the common living and meeting room. A team of educational and technical professionals pay close attention and give encouragement. How far is proven by the purchasable quality products in the workshop sales room. 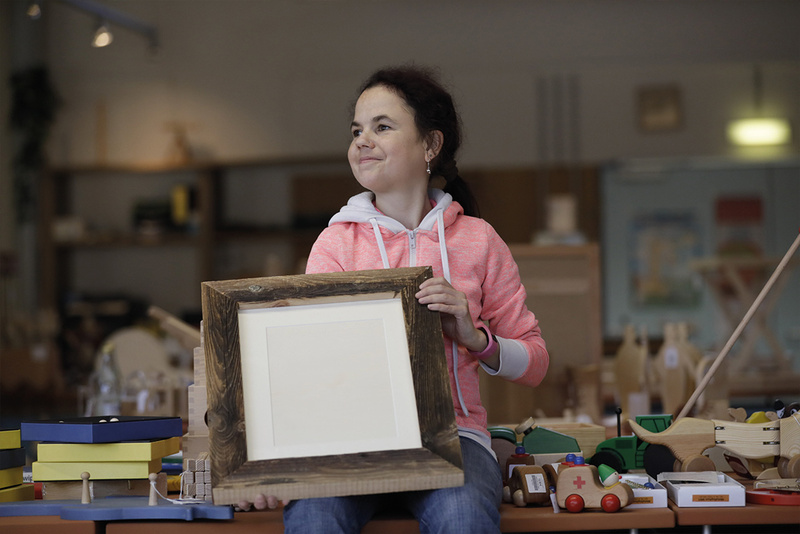 Made exclusively by people with disabilities, they demonstrates impressively that "good things take time". and that they really do become "good things". Wood as a material often comes from the region. For example, for the bread boards made of domestic maple - air dried and almost made into violins in Mittenwald, these wooden boards now look forward to an honest slice of bread and jam. The picture frame made of scrap wood are genuinely Upper Bavarian - what was a barn for years now frames personal memories. In conclusion, it only remains to be said that a browse around the sales room at the Werdenfelser workshops is a real feast. Whether toys, decorative articles, household products or furniture for indoors and outdoors - experience the diversity, find a centrepiece or place an individual order.